Cachumba is self-styled on its website as a “Cafe & Take Away”. It certainly does a fair amount of take-away business, but apart from that I’d describe it more as an informal restaurant. Food is brought to you at your table, though the menus are slipped under the practical glass that covers all the tables at each place setting. Service, like the restaurant, is informal and friendly. Be prepared to wait a while for your food if they are busy. It may look closed, but don’t be fooled – if it’s earlyish evening, then it is probably open despite appearances. But in marked contrast to most surrounding restaurants and bars, which parade themselves with open doors and outside tables, Cachumba keeps itself to itself. Behind the screens in the window is a lush red haven, with soft music that is as eclectic as the food. It is a world apart from the currently trendy minimalistic style – a world that is more gentle, and inhabited by a rare, quiet sub-species of West Didsburyite. It is difficult to describe the style of food, as it comes from around the world. The focus, if focus is the word for such a vast area, is South and South-East Asia, but there is at least one African dish on the menu too. Take a look at the menu on their website. I have my favourites, but I know others that prefer other dishes so I won’t bother recommending anything in particular. Vegetarians are well catered for. You may wonder, as I did, if it is possible to do justice to such a broad range of cuisines in one small restaurant. Maybe it is not, and I wouldn’t like to vouch for the food’s authenticity, but it tastes great. In particular, I am always struck by the vivacity of the flavours, presumably the result of everything being freshly cooked with fresh spices, and I always leave with a pleasant tingling sensation in my mouth. And I never leave feeling overwhelmed by the heavy greasy sauces that are all too common in Indian restaurants in the UK. All your dishes will by default be brought to your table more or less simultaneously, so if that does not suit be prepared to ask specifically for staggered servings. The portions are not huge, so you should probably think in terms of a couple of dishes each. Though having said that, the portion sizes seemed generally larger than normal when I was there last a week ago, and the Vietnamese prawn fried rice dish was huge. With spicy food, I would naturally tend towards aromatic white wine – well non-Chardonnay whites at least. It is obvious that the wines were all obtained from Vin Vino, and very modestly marked up. For example I see that you can buy the Solare Falanghina for £6.30 retail, and you can get it at Cachumba for only £8.95. Recently I have usually been going for the Kirabo South African Chenin Blanc. You won’t see it on the wine list on their website, but it is £9.95 (£6.90 retail). I didn’t take a tasting note, but I remember it being crisp and apply. At various points in the past year or so I have also liked the Falanghina and the Gewurz, but did not get on with the Pinot Grigio – I think they are the ones they currently sell but cannot be 100% sure. Anyway, Cachumba gets top marks for reasonably priced wines, and top marks for displaying their wine list in the window. It used to be BYO, but sadly no more. All in all I would highly recommend Cachumba. Great food, friendly and relaxed, and a reasonably priced wine list. I find it strange that it is always as quiet as it is, and think it deserves more recognition than it gets. If you don’t believe me, here are reviews on sugarvine and onionring. 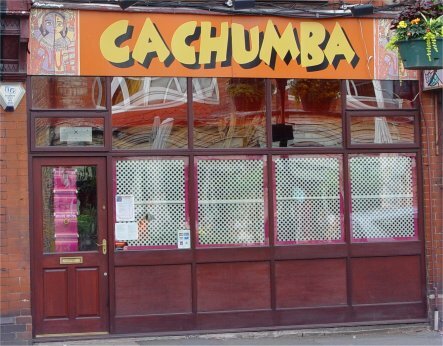 Cachumba is currently closed for refurbishment, and in their window there is an application for alcohol licensing from 11.00am to 11.00pm so they are clearly planning on having longer opening hours. Since I made the above post I have continued to enjoy meals at Cachumba. Let’s hope the new-look Cachumba will be as good, and also that it proves to be successful from a business point of view. Phew, drove past on saturday and heart sank I thought it had closed down, had to go to Carluccio’s in Manc which was awful. I’ve been a regular at Cachumba since it opened and have never been disappointed the food is always fantastic. Looking forward to the re-opening. You got me worried for a moment too Neil, expecially when I noticed their website was down. I was wondering if I was misinterpreting the situation. But I have just double checked the licence application notice, and it definitely says Cachumba on it. If I remember, I’ll let you know when it reopens. Would love to know when this place is reopening. Want to go for a Ruby Wedding anniversary in September. I wonder how I can find out? Any ideas? Renovation work is still in progress, but I have just spoken to someone coming out of Cachumba who said they plan to open next week. It’s reopen now, but is very different. It’s light and airy, and looks a lot like more like a typical Burton Road café. No idea what the food and wine is like. Just to let you know cachumba has reopened and the food is still the same but the dishes will change regularly to keep the menu fresh and exciting. I am writing this as a comment as I like my restaurant blog posts to be based on several visits, and this is based on just one dinner since Cachumba reopened – I was there with friends last night. The food is as excellent as ever, and though there were some new dishes, it is very much the same style And the prices seemd similar overall. So far so good. The ambiance is very different. I think I prefered the old style, but it is no big deal for me, and I am sure it now looks a lot more inviting to people who might be passing. Unfortunately the service was very stretched, to the point that it was difficult ordering more drinks when we ran out. Hopefully if it continues to be so busy more staff can be employed. The wine list was smaller than before, and sadly no longer featured any Chenin Blanc, which was what I usually go for. We had the Prosecco which was good, but unfortunately there was only chilled bottle (and presumably no ice buckets) so we could not reorder it. Next we had the Grenache Blanc, which was OK, and the Cab Sauv rosé which was like weak alcoholic Ribena. So that would be 3, 2 and 1 stars respectively according to my rating system. They were not expensive wines by any means, but I missed my equally cheap Chenin, which is refreshing and works so well with the food. BYO would be excellent – then I could drink exactly what I wanted to. What I disliked most was the way the new menu worked. Apart from a few specials, you had to order unspecified rice dishes for £11 or £15. They were flexible enough to accommodate a vegetarian, and someone who preferred bread to rice, but basically you got what you were given. The problem with this is that the dishes arrive one at a time, and you have no idea what else was to follow, so planning your eating in terms of personal likes and dislikes of those around the table was impossible. And we did not know how much to expect in total. Seema – by all means change your menu to keep it fresh and exciting, and have set menus if you wish, but please let us order from a menu so we know what we are getting. Mainly because of the menu and the wine list issues, I don’t think we will be visiting as often as we used to. But it is not like I am blacklisting the place, and I really want it to succeed. Remember how I started this review – the food is excellent. It helps us to provide a better service if people book tables so we can prepare. Also if everyone is drinking the same wine on every table, it is hard to guess what to chill the most. We are getting great feedback on the rice table and we let everyone know what they will be getting if they ask or if they want any special requests but a lot of people like the surprise !! Nice to see there is now a regular menu in addition to the rice table option. It is a little shorter than when I first posted here, but seems to contain my favourites.